This isn’t related to System Center, but I wanted to stick this out there in case someone else runs into the same issue. My lab runs on two Windows 8 machines. I haven’t played with Server 2012 much as of yet, however, I imagine I will be switching over at some point once I am able to carve out enough time to be able to take my machines down. At the same time, I imagine this issue might occur on a Windows 2012 machine as well. 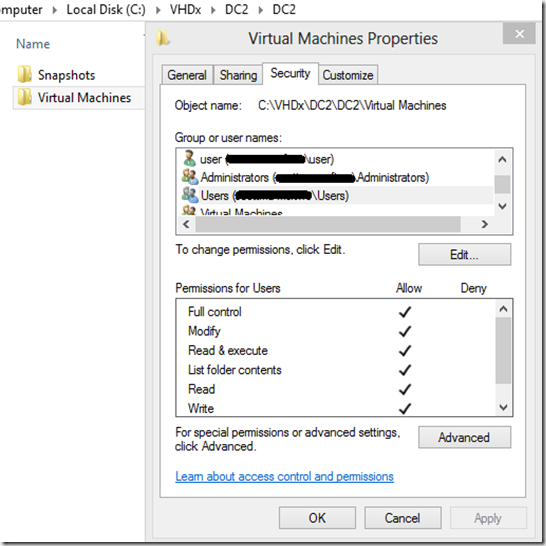 The Virtual Machines configuration 1E00D583-C468-4CBE-B077-623AE7A383D9 at ‘C:\VHDx\DC2\DC2’ is no longer accessible: General access denied error (0x80070005). Basically, what was happened was that I had too many VMs running along with my other work programs so the “server” ran completely out of RAM. I tried to shut a few of the VMs down to carve out just enough RAM to be able to shut everything down and it resulted in the Win8 equivalent of a BSOD. Post reboot, my DC running on this machine refused to start with the error above. I have no idea how or why, but the permissions seem to have changed. 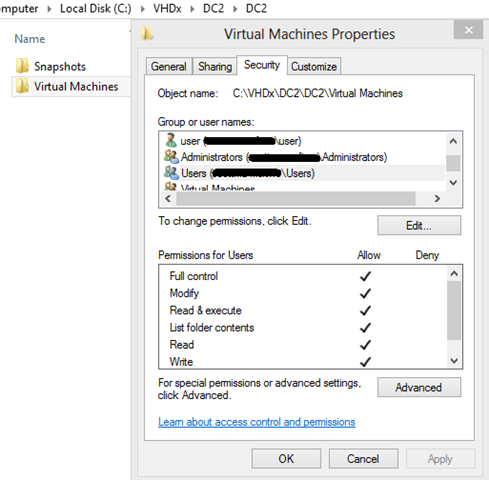 I granted <Local Machine>\Users “Full Control” over the Virtual Machines folder. Compliant? Probably not. Did it allow my DC VM to restart? Yep. If this were a prod environment, I would have spent more time investigating the exact permission that was missing. However, this is a secure lab with no sensitive data. My hope is to revisit this at some point (time permitting) to see if I can nail down the exact permission that was missing.